1) Everything I have read so far by the well respected raw lifters I look to, has the same message. Full range lifts (Squat, Bench, Dead)must be included as well as using exersises that will build the bottom of each lift (pause squats, dead squats, deficit deadlift ect) which would be the sticking point for the raw guys as opposed to equipt. How would someone set up a raw westside template that would include full range lifts using the conjugate method? And how would these be rotated so that on max effort day, both the squat and deadlift get worked? O.K. so this type of question is very common among those trying to understand Westside’s methods and I want to preface by saying the answer is extraordinarily simple! Most people tend to over-complicate the process entirely too much. That being the case, before I start explaining just take a deep breath, relax, and read very closely. First: Westside already incorporates full range lifts into their programs. If you understand their methods then you know full well that they incorporate full (and sometimes even more than full) ROM lifts every single training day. Second: Westside, above all, advocates training your individual weaknesses! If you’re weak out of the hole, Westside recommends training movements that strengthen you out of the hole. Likewise, if you’re weak at lockout, Westside recommends training movements that strengthen your lockout. That being the case, ANY movement that benefits you can be incorporated into your program. ANY MOVEMENT!!! As long as it actually provides significant strength gains then it’s 100% valid. Third: The template can be set up any way you want as long as you adhere to the general guidelines of The Westside Barbell Conjugate Method. You can incorporate these movements as part of your Max Effort main moves, Dynamic Effort main moves, or even as part of your accessory work. There is no “right” or “wrong.” There is only what works best for you! Fourth: Exercises can be rotated to focus on whatever you need most. If your Squat needs the most work then train your Squat before Deadlift. Conversely, if your Deadlift needs the most work then train your Deadlift before your Squat. Regardless, both can be trained on the same day assuming you aren’t working up to a 1RM in both. For example, on Max Effort Lower you could work up to a 1RM in a Squat variation followed by 3 x 5 heavy Deadlifts. Simple, basic, and effective. 2) For the raw lifter, How would you set up the max effort rotation to optimally train the squat and deadlift and when to rotate between a squat movement, deadlift movement or a goodmorning movement? I have read a number of things which include switching from a squat to deadlift on alternating weeks as the main max effort move, using goodmornings as assistance only, using 3 week cycles for main max effort moves for a beginner, using 5 rep or 3 rep maxes if someone is a beginner or wanting to gain mass (that one was from louie himself I believe) as well as doing 3 weeks of a squat variant as max effort then using a deadlift variant for max effort for 1 week. Since you asked for my opinion I’m going to give you what I [currently] think is best. Keep in mind, though, that Louie may completely disagree with what I have to say. First: Train what you’re weak at. If you’re weak with your Squat then train your Squat. If you’re weak with your Deadlift then train your Deadlift. The principle of specificity will always hold true. Second: Generally speaking, I like to alternate Squat & Deadlift Max Effort lifts on a weekly basis. If I’m feeling “off” then I’ll throw in a 3RM Squat OR Goodmorning variation depending on what I feel like. Keep in mind, this is a general recommendation and not specific to individual needs. When in doubt, always refer to my first point – train YOUR weakness. Third: Anecdotally, I’ve recently switched my Max Effort Day’s to anything between 1 – 4 sets of 1-5 reps. All sets/reps are “Max Effort” but it gives me a little more variety than solely working up to a single. I still see the benefits of working up to a single very often, but the variations in volume/intensity that 1-4 sets of 1-5 reps provides are – in my opinion – far more beneficial in the long-term. 3) Continuation of 2. What lifts and variations would you suggest for the max effort rotations for the raw lifter and how long should they keep with the lift? eg 1 week-3 weeks? First: Whatever lifts work best for the individual. There is no right or wrong here. There are literally hundreds (if not thousands) of Squat & Deadlift variations. TRY THEM ALL! Experiment and see what you enjoy/works best for you. I’d note, I think too often people place an overwhelming emphasis on exercise variation. Yes it’s important but what’s more important is variation in volume & intensity. Some people have gotten extremely strong with just a standard barbell and weight plates. No need to over-complicate things. Load up a bar – any bar – and lift! Second: I prefer to stick with a given lift for 3 weeks at a time. I’ll let beginners stay on for 4 weeks but intermediate/advanced lifters are generally best suited for 3 week intervals. 4) How often should a lifter re test their progress on the competition lifts to see if their exercise selection in max effort and accessories is improving the competition lifts? Again I have heard a few different variations from every 5 weeks to 12 weeks? Well this is an interesting question and, first, let me respond with a question: Why do you need to test the competition lift? Why couldn’t you use another lift (deficit deadlift, SS bar squat, etc) and see if you’ve improved since last time? Generally speaking, if one major variation improves then your competition lift should improve as well. 5) Mass gain. Louie has written about extra workouts as well as about having trained the bodybuilder Mike Francois in the 1990’s at Westside. Do you have any thoughts on someone who wants to gain mass and what they should include in their extra workouts? Some things from Louie suggest that the max effort or dynamic workout should be performed in the morning and an extra workout for bodybuilding accessories like pecs, quads ect can be performed in the evening. Anything to add on that one? First: Use higher reps with your main movements. Max Effort is defined as 1-5 repetitions (or 85%1RM and above). Feel free to use 3-5 sets of 3-5 reps to accrue more volume and achieve the necessary stimulus for muscle growth. Second: Cycle through various 3 – 6 week phases. For example, spend 3 – 6 weeks focusing on hypertrophy (i.e. your accessory work should be high(er) volume geared towards muscle growth) and then spend the next 3 – 6 week phase focusing on strength (i.e. your accessory work will be reduced in volume and increased in intensity). You can continue in this pattern for a very long time as it spares the CNS and joints, not to mention it provides an extraordinary environment for both strength and hypertrophic gains. Third: A second training session later in the day is a great idea but, generally speaking, it CANNOT be high volume or intensity. It needs to be extremely light weight and very high reps. Unless you’re on anabolic steroids, these sessions can easily be overdone. In fact, now that I think about it, I’d prefer drug-free lifters to stay in the gym longer for a single session as opposed to coming back later in the day for a second evening session. 6) Assistance lifts for the main lift ie. doing rack pulls after max effort for 3 sets of 3 or 5. Can you ellabourate on what to do for a main assistance lift after the max effort lift and how these should be rotated? Also can you perform more than one assistance exercise for the main lift? First: The assistance lift after a Max Effort move needs to be very heavy. Personally, I find anything between 3-4 sets of 3-6 repetitions to be perfect. Second: In regard to specific lifts, you know my answer….TRAIN YOUR WEAKNESS!!! Third: Rotate them like all other assistance lifts – every 1 -3 weeks (3 weeks being ideal in my opinion). Fourth: Performing more than one main assistance exercise is likely a recipe for disaster. It’ll take way too long to get in & out of the gym and you’ll likely be doing wayyyyy too much volume for Max Effort days. Keep it to a single accessory lift for the main move. 7) Daily work. What would your suggestions be?For example if someone has weak hamstrings and lower back, would you set up daily work for them to do eg band leg curls and band goodmornings? Sure, that’s absolutely a valid option. I’d honestly prefer more sled towing, back raises, and reverse hypers instead of band hamstring curls but at this point I’m just nit-picking. 8) Gpp/sled work. How would you have someone wanting to increase their squat and deadlift use sled/farmers walks to do so? Tow the sled for 40 – 80 yards. 9) Dynamic lower day. For a raw lifter what would some variants be ? Should these be changed to repitition days? First: I know this is going to be considered blasphemy but the main thing to take note of here is that I don’t think raw lifters should be squatting to a box as often as geared lifters. In fact, I think raw lifters should mainly free squat. This doesn’t mean box squats need to be excluded completely but – by and large – raw lifters should be squatting without a box. I actually covered everything related to the squat (technique, programming, variations, etc) in my Elite Performance Squat Seminar. 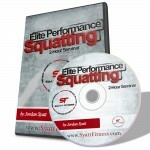 If you’re a raw lifter and want to add some serious weight to your squats, check it out. Second: No, these should not be changed to repetition days. Do speed work just like geared lifters except raise the percents to anywhere between 60-80% 1RM. 10) Should deadlifts be done from the floor on these days? and would you increase the percentages for raw? First: Deadlifts can be done from the floor, absolutely. You can do any Deadlift variation you want. ANY/ALL VARIATIONS ARE VALID!!! Second: Yes, percentages for raw lifters should be increased. As I said in the previous section, generally 60-80% 1RM is a good starting point for Dynamic Effort work. 11) Volume for the raw lifter. When working to a max effort, how would you use volume to ensure the lifter is getting in enough work and not just going for a max (probably a common issue with newer lifters to westside) and how should the work be done above 90%? I wrote an article entitled How to Work Up to a 1-Repetition Maximum. You can read it here —-> How to Work Up to a 1RM. If you follow these guideline then you’ll accrue plenty of volume. 12) again on volume for the raw lifter. Are back off sets after the max effort lift worth doing? In my opinion, no. They’re a waste of time and energy. Hit your prescribed sets/reps (3-5 sets of 1-5 reps) and then move on to the main accessory move.